You can predefine the server connections in GoAnywhere MFT as reusable "Resources", which will save time and ensure quality when defining file transfers and other tasks within Projects. Instead of re-typing connection details for each task, the desired Resource can simply be selected from a drop-down list. Resource definitions include the server connection details, such as the host name of the server, port number, login credentials and preferences. For separation of duties, certain users can be authorized for creating and maintaining Resources. The properties for these Resources can be hidden from other unauthorized users, preserving the confidential connection information for your trading partners. 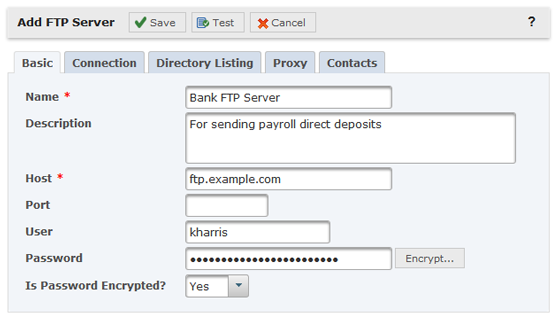 All Resource definitions are stored in GoAnywhere MFT's central database. Any passwords specified for Resource authentication can be stored in encrypted form. When creating a resource, specify a unique name and the settings for the Resource. For instance, if defining a FTP resource, you would specify FTP connection settings such as its host name or IP address, user and password. A resource connection can be quickly verified by clicking on the "Test" button.